Dalit protesters blocked trains, clashed with police and set dozens of vehicles ablaze in several states during a nationwide bandh. The present BJP government at the Centre has made it clear that Sabka Saath Sabka Vikas was and is only a jumla for them. Their inability to bring about social harmony coupled with the use of communities as votebanks are the root cause of the protests happening these days. According to the National Crime Records Bureau (NCRB), the number of crimes against dalits has risen in recent years. As per government data, at 2016-end, about 90 per cent of cases involving crimes against dalits were still awaiting trial. The NCRB also says there has been a sharp increase in such crimes in states like Haryana, Uttar Pradesh, Madhya Pradesh and Gujarat. In January 2016, Rohith Vemula, a research scholar at Hyderabad Central University, committed suicide because of the discrimination he faced being a dalit. After his death, there was a concerted effort by BJP leaders to raise doubts on his being a dalit. They came up with all sorts of bizarre explanations for his death. I just want to ask the BJP leaders what happened to the university officials who were in positions of power when Rohith died? Who were the senior government functionaries with whom these officials were seen? Also, what did the ministry of human resources development do with the Ambedkar Periyar Study Circle at IIT Madras? These are a few acts that show the government’s inbuilt bias against dalits. Earlier this year, when riots erupted against dalits in Koregaon Bheema village of Maharashtra, the state government was a mute spectator. Sambhaji Bhide, one of the accused in the riots, is yet to be arrested. Instead of taking action against Bhide, Maharashtra chief minister Devendra Fadnavis gave a clean chit to him. In fact, some news reports state that Bhide had been recommended for a Padma Shri in 2016 by a high-powered committee comprising 10 senior ministers. Significantly, the recommendation had been made by the committee using its discretion, even though the government had not received any nomination for it. 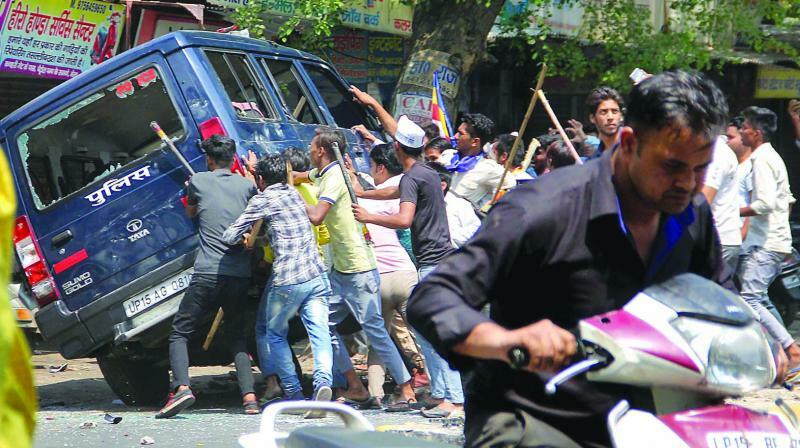 In the last couple of weeks, there have been seven instances of vandalising the statues of Babasaheb Ambedkar at Allahabad, Hathras and Siddharthnagar in Uttar Pradesh. What action has the government taken against these vandals? There were also incidents of flogging of dalits in Una (Gujarat). While ministers like V.K. Singh and Ananth Kumar Hegde issued statements condemning these acts, there has been no word from the Prime Minister. As a result of all this, a major section of the population has lost faith in the present government. The recent Supreme Court judgment on the SC/ST Act and the response of the government on it has been very troublesome too. It shows that the BJP is only interested in dalit votes. Amid all this, the core ideology of the BJP and RSS — of forming a casteist-communal Hindu Rashtra — that is antithetical to the interests of dalits, is evident. A drastic reduction of the budget in affirmative policies like the SC/ST sub-plan and many such instances have led to a situation where dalits are revolting. Ds have never found their voice under any BJP government and they will never find it in future, despite all the pretensions of the BJP. Congress president Rahul Gandhi recently sparked off a huge debate by proclaiming that dalit anger across India erupted as the BJP-RSS aren’t interested in their uplift. After the recent spate of dalit strikes across the country, Mr Gandhi questioned the BJP and RSS’ DNA and accused them of neglecting dalits, conveniently forgetting his own party’s approach towards the always-neglected SC and ST segment. Leaders like Mayawati and Rahul Gandhi have always milked the dalit issue for their selfish political gains. By repeating their vile strategies, they are once again turning towards their “tried and tested” evil approach of dividing the country on the grounds of religion, race and caste. The fact is after the demise of Dr Bhimrao Ramji Ambedkar, the Congress has vehemently tried to suppress his ideas. The Congress has always downplayed Dr Ambedkar’s contribution to the country. That he was awarded the Bharat Ratna 34 years after his death (in 1990), and that too by the V.P. Singh-led government, not the Congress, is an ample proof of this. One can even go to the extent of claiming that the Congress tried to erase Dr Ambedkar’s principles from people’s psyche. The Congress never worked towards his vision of a “New India” that is free from casteist movements. On the contrary, the Congress and other parties just tried seeking votes in his name. The government developed pilgrimage spots in Delhi, Mumbai, Nagpur, Mhow and London in Dr Ambedkar’s name. Prime Minister Narendra Modi unveiled two statues of the dalit icon at Janpath in New Delhi. Everyone is aware of Dr Ambedkar’s contribution in building an all-inclusive nation that focuses on the uplift of the underprivileged. The BJP government dedicated the Bhim app as the government’s tribute to his work in that direction. The mobile app is aimed at helping the poor and underprivileged people. The government has launched several social welfare schemes aimed at implementing Dr Ambed-kar’s vision. The Jan Dhan Yojana made banks accessible to lakhs of poor and deprived citizens who never had the luxury of having their own bank account. The Ujwalla Yojana brought in electricity to thousands of poor households. The Swachchh Bharat Abhi-yan helped poor women who suffered ill-health due to lack of toilets. Decks have been cleared for construction of a memorial dedicated to Dr Ambedkar at Indu Mill in Mumbai. It will house a 350 ft high bronze statue, exhibition halls, research centre, lecture halls, library, conference halls, meditation centre and auditorium. This is the BJP’s way of preserving Dr Ambedkar’s memory. Sadly, the Opposition, as always, has chosen to overlook the unparalleled efforts taken by the government to uplift the downtrodden and backward classes. They choose to continue with their detrimental strategy of caste-based politics.